Does My Samsung HW-F850 Sound Bar Support ARC? The HW-F850 does support ARC, see below for more information on ARC and how to connect. ARC (Audio Return Channel) is supported by high speed HDMI cable connections and allow TV's with ARC capabilities and ARC capable devices to transfer audio back and forth using just one HDMI cable. For example, in devices that don't support ARC you would need to connect your Sound bar to a TV using one HDMI cable, and then connect your TV to your Sound bar using a second audio cable. • You will need an HDMI cable to connect the Sound Bar to your TV. A High Speed HDMI cable is recommended. • Disable TV Speakers. See the accompanying literature included with your TV for instructions. • Power off both the Sound bar and TV. Since your TV supports ARC (Audio Return Channel) all the audio from the devices connected to your TV will be sent to the Sound bar using one HDMI cable connected between the TV and Sound bar. This is what makes ARC easy to use. Follow the steps below to connect your ARC TV to the Sound bar. 1. Connect one end of the HDMI cable to the HDMI OUT port on the back of the Sound bar. 2. Connect the other end of the HDMI cable to the ARC HDMI IN port on your TV. This will send audio and video out from the Sound bar into the TV, and send all TV audio to the Sound bar using ARC. 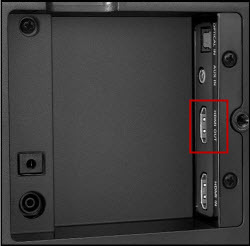 • If your TV is a Samsung 2012 TV (E model) the HDMI IN 2 port is labeled as ARC. 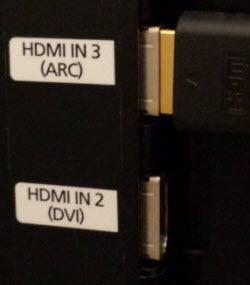 • If your TV is a Samsung 2013 TV (F model) the HDMI IN 3 port is labeled as ARC. • If your TV is not a Samsung TV look for the HDMI port labeled as ARC. 3. Power on any external device connected to your TV or Sound bar and then power on your TV and Sound bar. This is the last step in connection setup. See below 'Setting the source' for instructions on selecting the corresponding input based on device connection. • ARC is activated in D.IN mode, D.IN displays on the front display. IMPORTANT: If you do not have audio when connected to a TV, verify the TV speakers have been turned off and TV audio is being sent to Sound bar. In some Samsung TV's this setting is under Settings>Audio and sometimes labeled as 'Internal Mute' or 'Speaker Select'. • To listen to audio from your TV (and any devices connected directly to your TV) via ARC change the source on your TV to the input where the external device is connected. 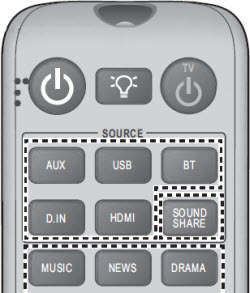 For example, if your cable box is connected on Component 1 on your TV you would press the source/input button on your TV remote until it was set to Component 1. The Sound bar would then automatically change over and display TV ARC on the front display. It takes about 4-5 seconds for the Sound bar to output audio from your TV. • If you have connected external devices to your Sound bar you must press the Source button on the Sound bar remote control until you see the input where the external device is connected. For example, if you connected your Game console to HDMI on the back of your Sound bar, you would press the Source button on our Sound bar remote until the front display of the Sound bar reads 'HDMI'. • If you have no audio when using ARC press the Anynet button on your Sound bar remote once and then twice to toggle the Anynet function on/off, Anynet must be set to ON for ARC to work. Also, the TV audio settings must be set to external speaker. • When using ARC you can use either the TV or Sound bar remote to adjust the volume settings when the Sound bar is connected to a Samsung TV. • When using ARC you must power off the TV first and then the Sound bar will power off automatically. If you power off the Sound bar first the TV will stay on and the audio will be output through the TV speakers. You can use either the TV or Sound bar remote to power off both devices. This is only available when the Sound bar is connected to a Samsung TV. • If you power off your TV first and the Sound bar does not power off check your TV menu System settings and make sure the Anynet Auto Power Off setting is set to ON in the Anynet menu. Once you have verified this setting is on make sure your TV and Sound bar are both on and then power off your TV first. The Sound bar will power off automatically. This is only available when the Sound bar is connected to a Samsung TV. • The Sound bar will turn off automatically if there is no audio signal for 20 minutes in BD/TV/USB/HDMI/ARC/D.IN modes. • The Sound bar will turn off automatically if there is not key input entered for 8 hours when the cable is connected. In other words, if you are using the Aux input and no buttons are pressed, the Sound bar will turn off. Are There Firmware Updates For My HW-F850 Sound Bar? How Do I Use The Sound Effect Buttons On My HW-F850 Sound Bar?